After the first round of the 2012 Formula 1 season in Australia, there were no longer any surprises between the grand prix teams. With Albert Park a memory (a most positive memory for the McLaren F1 team), focus has turned to the Sepang International Circuit where preparations to run the 56-lap Malaysian Grand Prix was centered on Saturday's qualifying. Maintaining a perfect performance in 2012 Formula 1 qualifying, Lewis Hamilton flew to pole Saturday for the Malaysian Grand Prix. Taking the McLaren-Mercedes to the front of Sunday's race grid with a 1-minute, 36.219-second run in the Q3 qualifying session, Hamilton was 15/100ths of a second quicker than teammate Jenson Button. 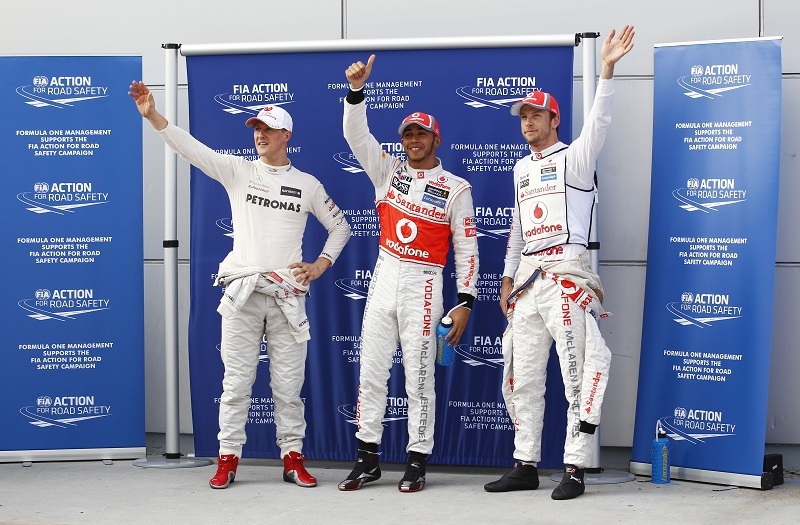 Opening the season big, the McLaren F1 team duo of Lewis Hamilton and Jenson Button have stood on three podiums already in 2012. 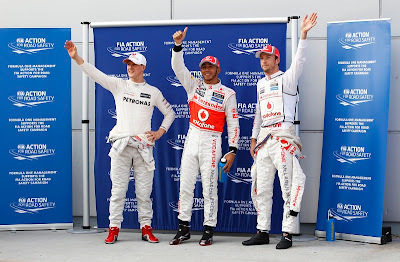 The McLaren-Mercedes success came as a result of a successful battle against the full-factory Mercedes-Benz effort. Mercedes GP drivers Michael Schumacher and Nico Rosberg were both impressive throughout qualifying around the 5.543-kilometer Sepang International Circuit. 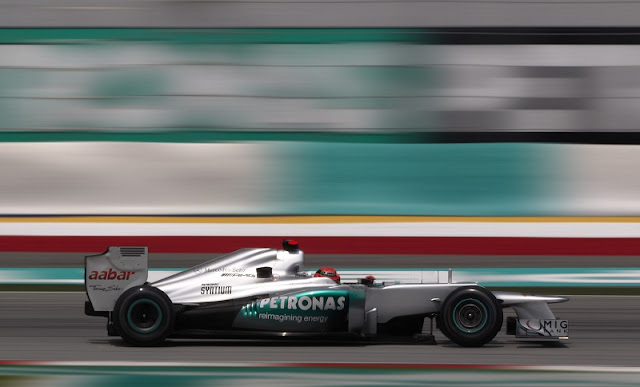 Schumacher was second-fastest in Q1 while Rosberg posted a third-quickest time in the Q2 session. When it came to the final Q3 session, Nico Rosberg struggled to an 8th place finish after locking up his Pirelli tires through the first turn. Posting a 1-minute, 36.461-second time in Q3, 7-time Formula 1 champion Michael Schumacher soared to a third-place grid position (the highest qualifying spot for a Mercedes GP car since the team's formulation in 2010). Schumacher's first top-three qualifying effort since the 2006 Japanese Grand Prix, the driver of the Mercedes F1 W03 was understandably positive in the post-time trial interview. "It felt nice being in the qualifying press conference for the first time in over five years! What is obviously more important would be sitting here again tomorrow," said Schumacher. Only the second race in the 2012 Formula 1 season, assumptions of the Red Bull Racing organization would indicate the team has lost their qualifying pace that was pivotal to a 2011 driver and constructor championship. The Red Bull-Renault of Mark Webber qualified 4th place for Sunday's race at the Sepang International Circuit. Lotus-Renault driver Kimi Raikkonen equalled Webber's 1-minute, 36.461-second time but had to settle for 5th place due to the Red Bull-Renault registering his time first. Raikkonen will relinquish 5 grid positions Sunday for a gearbox change. This is the second event in a row where Mark Webber out-qualified his teammate Sebastian Vettel. The two-time Formula 1 champion and last year's Malaysian Grand Prix winner Vettel could only muster an 8th place on Sunday's race grid. In Australia, Vettel importantly finished in 2nd place after 58 laps. Continuing their struggles shown in the Australia Grand Prix qualifying group, the Scuderia Ferrari team drivers Fernando Alonso and Felipe Massa have been unable to get a hold of the 2012 race car's tricky handling. Alonso's Ferrari made it into the Q1 session but could only mount a 9th fastest time on the Sepang International Circuit (Alonso will start 8th based on Raikkonen's penalty). Felipe Massa is starting in 12th place for Sunday's Formula 1 event. Massa's best finish in the Malaysian Grand Prix is 5th on three occasions. The 2012 Malaysian Grand Prix will be a full grid Sunday of all 24 cars. Failing to make the field for the Australian Grand Prix, the HRT-Cosworth cars of Pedro de la Rosa and Narain Karthikeyan fared better in on the 5.543-mile Malaysian track.